It’s Tuesday, I have a rare day off, but I have a full week and some change of long days and short nights ahead. I’m pre-exhausted. When I’m pre-exhausted, there’s nothing better than slipping into an easy chair, putting on a soothing record, and letting the music give me a back rub. As of late, this album has been that back rub. As simplistic as this album was, this was an unusual and rather revolutionary album for Gerry Mulligan. When this album was recorded and released in 1962, Gerry Mulligan had almost never recorded an album with the standard quartet format of horn plus rhythm section. He always had another horn as a soloist, the lone but famous exception being Mulligan’s album with Thelonious Monk in 1957. Even then, it wasn’t your average quartet date, as Thelonious is anything but average. For this date, drummer Dave Bailey, a long-time associate of Mulligan, wanted to produce an album that featured the more mellow side of his former-boss’ sax. He couldn’t have picked a more perfect setting for Mulligan’s warm baritone sax. Tommy Flanagan was one of the tastiest, most perfect musicians to ever tickle the ivories, which he does here with typical graceful elan. Ben Tucker was a bassist who played with numerous jazz luminaries (Herbie Mann, Dexter Gordon, Art Pepper…) and holds things down on the album with a no-nonsense elegance. Dave Bailey’s own drumming is no-frills, supportive, and in the pocket. In other words, perfect. Add some light conga to give the music extra bounce and character and you have a wonderful setting for Mulligan to spin languid lines of lyrically loping music. The entire album is perfect. There’s not a clunker among the set. None of the tunes get above a healthy walk, all of them flowing along and making your foot tap in the process. Picking one tune to highlight was near impossible. In fact, I still don’t know which one to pick. I thought about picking one of the two tunes by Billy Taylor that Mulligan and company included on the album. “Capricious” and “Inside Impromptu” were both written and recorded earlier in 1962 by Billy Taylor (on the equally perfect album ‘Impromptu’, which I have and have been meaning to write about because wow), and I was surprised to see both tunes appear on Mulligan’s album. They seemed like rather obscure tunes, but here they are. I’d like to know the story behind their inclusion here. The other material on the album comes from equally far-off places. There’s a showtune from Cy Coleman (if you know who Cy is, please collect your hip card at the end of the post), a tune from an old musical, and an original blues. On albums that I really dig, I always find it amusing to see what kind of rating and review Allmusic gave it. I wasn’t disappointed. Our pal Scott Yanow gave the album three stars, and although he concedes that Mulligan is great and the music is good, it’s “not all that essential.” Depends on what’s deemed essential and why it’s considered essential, I suppose. Sometimes you don’t need an album of music to provide a challenging listen, or a record with lots of fireworks and verve. No, sometimes all you need is a rock solid, simplistic album of music that provides both a soothing soundtrack for relaxing and a pleasurable listening experience if you actually pay attention to what’s going on. That’s what this album is to me. Well, I’ve reached the end of the music section and still don’t know which tune to pick for the spotlight. Whichever tune ends up there, you’ll know that it was picked with much consternation and prayer. Ignoring the remnants of the time listing for the tracks (this was a radio DJ’s album), the picture itself is…eh. I’ve seen numerous shots of Mr. Mulligan at work that look a lot better than this. When it comes to pictures of perspiring musicians, it’s a fine line between artsy artist and a sweaty dude. Blue Note was good at the former. This is an example of the latter. And it’s uncomfortably close. That’s just the photo. The font used couldn’t have been uglier, especially for 1962. It’s all around not one of Columbia’s shining moments. As for the sticker proclaiming Mulligan to be a ‘new star’ on Columbia, that’s either false advertising (he had like two other albums released on Columbia, including one I wrote about) or just disrespectful (he’d been a star since the early 50’s with Chet Baker). It’s all bad. It’s always nice to have a picture of the musicians on the back cover, especially when it’s one of the group in the studio. The liners themselves are solid. Prior to 2019, I had never heard of Joe Goldberg, but since February I have seen his name on numerous albums writing liners. I’m still not sure who he was, though. I’ll have to do my Googles. This album belonged to a guy named Don Howard, a man who according to my research was a radio DJ in San Diego, California in the 1950’s and 60’s, maybe longer. I own a few of his albums, and they all feature his name handwritten on the back, his stamp on the labels of the record itself, and his notes on each track. Those notes are usually a variation of “fine” or “terrific”. For instance, he thought the tune “Here I’ll Stay” was “real fine man”. Highly amusing. Interestingly, another Mulligan album that I own features a pair of track recorded in San Diego in 1954. Guess who produced it? Don Howard. Is it the same Don Howard? I don’t know, but I’m pretty sure! The two-eye labels from Columbia in the 1960’s was already hip in red, but in white, the label looks downright minimalistic in best sense of the word. So clean. This being a promo/radio copy, the total time of the side is included on the label, a feature that wasn’t included on regular copies. This being 1962, gone is the deep groove of the previous decade. The promo labels mirrored the labels that were being used on regular copies, and this is one of the few Columbia LPs I have from the 2-eye ‘GUARANTEED HIGH FIDELITY’ era of the early 60’s. Acoustically speaking, this album was recorded expertly. However, it was NOT recorded by or for Columbia. Dave Bailey funded this record session and had it recorded hundreds of feet above New York City at Nola’s Penthouse Studios. Columbia later bought the tapes and released it on as a Columbia album. Mulligan recorded for more record labels than Erroll Garner. Nola’s Penthouse was renowned for its recording equipment and acoustics as well as its lofty location 17 floors above the glittering city in the Steinway Building. I found a few pictures of what the studio looked like in its heyday, and it doesn’t look like the type of place that would result in superior recordings. Then again, Rudy Van Gelder recorded musicians in his parent’s living room. 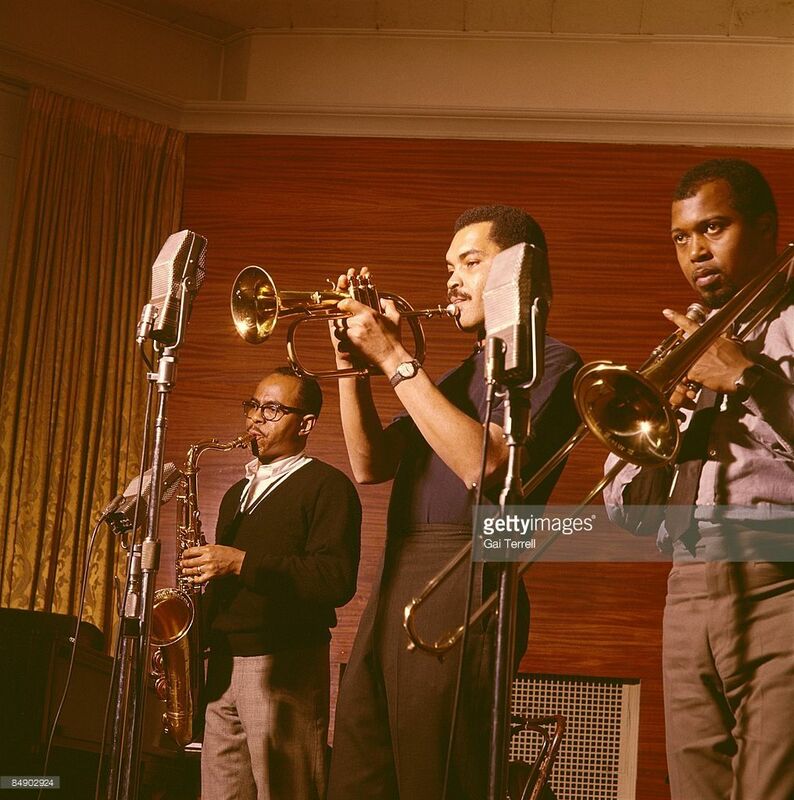 Benny Golson, Art Farmer Grachan Moncur III in action. 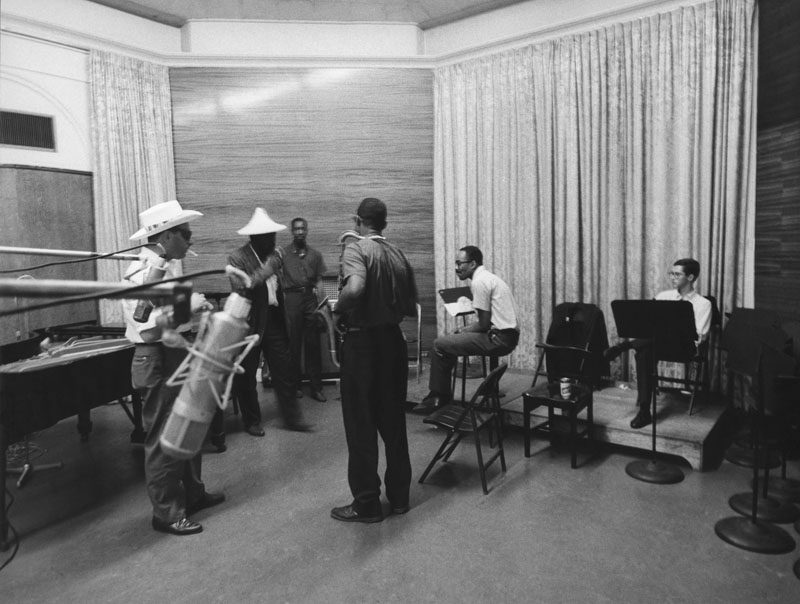 Thelonious Monk, Charlie Rouse, and others at the Penthouse. Those drapes must have been the secret. My copy is in glorious mono, bringing all the instruments close and up front. Rather intimate, with Mulligan’s sax purring into the mic. I’d like to know how many jazz albums were made in Nola’s Penthouse, as I don’t think too many were. I have a few, and all but two (both for Mercury…) sound fantastic. A few weeks ago, when I was back in Southern California, I hit up the local record store in Redlands, named, oddly enough, Redlands Vinyl. They must have been reading my blog, because the prices were more reasonable than the last time I was there (2017). Shortly after my epiphany over that Ahmad Jamal record, I found this album. I wasn’t familiar with it, but seeing Tommy Flanagan on it and that it was straight-ahead jazz session, I grabbed it. The record store has a ton of Don Howard’s albums and has had them for a while, as I picked a few up when I was there in 2017. He kept his albums in fantastic shape, which is a pleasant surprise. Not all radio DJs did. Adding records to my own collection with a history like this is one of the many reasons why I dig for vinyl. Albums on iTunes don’t have histories like this. And who knows, maybe this Don Howard is the same Don Howard that produced that 1954 concert for Mulligan! Oh, and after picking up a ton of records, the guy behind the counter at the store gave me three for free, this one included. I may not be a college student anymore, but I will never turn down college student savings. Great post, Tarik, as usual. Thanks! I knew that was the record being made when that picture of Thelonious was being made but didn’t realize Sam Jones and Art Taylor were there too, so thank you for pointing that out. I heard that music was not all that memorable. What was your opinion on it? “Cheese” haha. Yeah it took me a minute to decide which track to use because the whole album is tasty. And of course RVG interned at Nola. One master studying from another. I didn’t know that, but that makes sense. Scott Yanow was having a bad day when he only gave this 3 stars – he had many bad days. “Jeru” is always in my Top 10 of Gerry Mulligan albums. If I had to pick a favourite track it would be “Lonely Town” – gorgeous tune to finish the album. Reputedly Columbia chased Dave Bailey hard for the tapes and paid top dollar in the process. Columbia released this on CD with updated liner notes by Bill Bailey and new images. Tommy Flanagan’s playing is superb. He and Gerry were great pals.